ezClearWater.com is the official Residential Distributor of Selecto filtration systems. Selecto is the industry leader in filtration technology. Selecto has been in business over a quarter century providing filtration for many industries, including thousands of restaurants and the world's largest beverage producers like Coke and Pepsi. Now home owners can also have Selecto's superior Hollow Carbon technology for their whole house or drinking water. Selecto is the ONLY water filter manufacturer with the ability to create their own filtration media. Their Hollow Carbon technology is an advanced media that allows Selecto filters to be so effective at reducing Chloramine and eliminating the need for pre-filtration in most circumstances. Selecto is also the creator of Nano Titanium Dioxide used to make the NanoSTICK - a chemical free water clarifier that ZAPS organics like ammonia and dead skin and body oils on contact. Selecto is also known for their superior Customer Service! They believe in their products and stand behind them. This makes it very easy for ezClearWater.com to also give you great Customer Service! Made in the USA! No tools required for cartridge replacement. 50,000 gallons for Chlorine; 15,000 for Chloramine. Yes! They really work! Lowest Price on the Web! The NanoSTICK® for Spas is a Revolutionary new product for Spa sanitation! Tired of scrubbing that Ring Around the Hot Tub? NanoSTICK® for Spas Zaps organics like body oils, dead skin, and ammonia into a gas that disappears! Works on contact. No installation required. Tested at 5.0 gallons per minute Flow Rate. Actual rate 7-8 GPM. 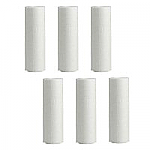 Use with Contamin-Eaters: 710, 710-2 FL, 714, 714-2 FL, 720, 720-2 FL; and Legacy Point-of-Use Drinking water filters. SMF Contamin-Eater 710 Whole House Water Filter recommended for a house with 1-2 baths, 1-2 people. * For Chlorine, this filter is large enough for 2 people for a full year. * For Chloramine, this filter is right for 1 person for a year. Legacy 105F is the same as our 105 except that it includes a Shut-Off Valve and a Gauge to alert you when it's time to change your cartridge. Tested at 5.0 gallons per minute Flow Rate. Acutal rate 7-8 GPM.